This Honey Orange Iced Chai Tea is a delicious twist on your average cup of tea. It’s naturally sweetened with honey and has a hint of fresh orange and warm spices in every cup. I drink tea on the daily. Call me predictable, but I require a caffeinated pick-me-up to get me through the afternoon. Every Sunday, I make a big batch of this Honey Orange Chai Iced Tea and stock the fridge for the entire week. Instead of making a large pitcher, I divide the warm tea between five mason jars for a convenient on-the-go beverage I can take with me wherever I go, which is usually back upstairs to my home office. Bring a kettle of water to a boil. While you wait for the water to come to a boil, prep 5 mason jars with two orange slices each and 1-2 tablespoons of honey. In a separate heat-proof pitcher with a spout, add 5 Lipton Enticing Chai tea bags. Pour 3 cups of boiling water over the tea bags and steep for 10 minutes. Remove the tea bags and add 3 cups of cold water. Divide the warm tea between the 5 mason jars. Secure the jars with lids and shake to combine the honey. Place the jars in the refrigerator to chill. 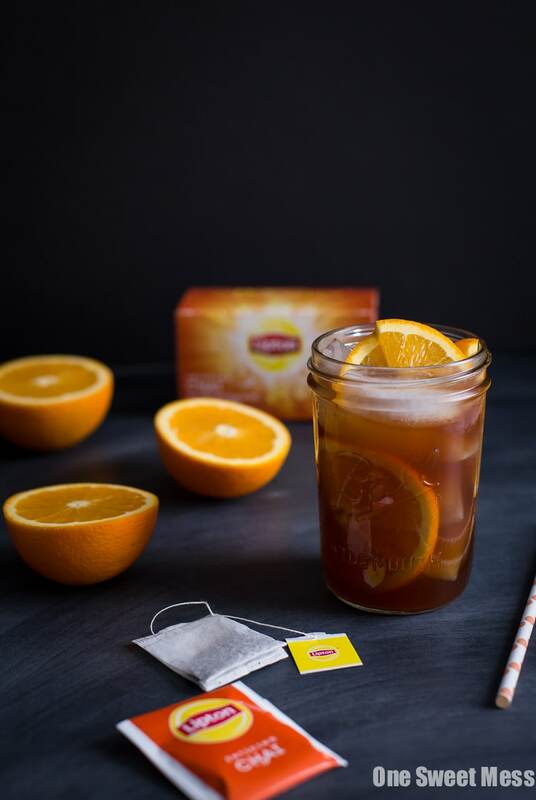 Lipton’s Enticing Chai Tea adds pops of warm ginger, cardamom, and cinnamon that pairs perfectly with the fresh slices of orange in each cup. This refreshing blend of tea is bold, flavorful, and naturally sweetened with honey. Crisp iced tea with the refreshing flavors of sweet orange and warm spices. Each cup of tea is naturally sweetened with honey. Bring a kettle of water to a boil. While you wait for the water to come to a boil, prep 5 mason jars with two orange slices each and 1-2 tablespoons of honey (depending on how sweet you like your tea). In a separate heat-proof pitcher with a spout, add the tea bags. Pour 3 cups of boiling water over the tea bags and steep for 10 minutes. Remove the tea bags and add 3 cups of cold water. Divide the warm tea between the 5 mason jars. Secure the jars with lids and shake to combine the honey. Place the jars in the refrigerator to chill. I drink 2-3 cups of tea per day, and love the sound of this iced tea for when the weather warms up a bit here. I’ll be looking for that Lipton’s chai, for sure! I’m all about ice tea in the summer and this sounds nice and refreshing and not too sweet either! Just perfect. I live on tea all year round. I could drink iced tea all day long, and hot tea every morning!